North Williamsburg, in Brooklyn, is not known for its gardens. Most of the neighborhood’s residential blocks feature rows of simple low-rises without much evident greenery. But behind one unassuming blue clapboard house on a fairly gritty street is a charming, lush garden with a stream and pond that is also serving an important environmental function. This space, along with the home’s small green roof, was specially designed to absorb excess rainwater and protect local waterways. The homeowners, both entrepreneurs, bought the property with its original 1910 house in 2012, fully aware that the existing structure was too dilapidated to be saved. 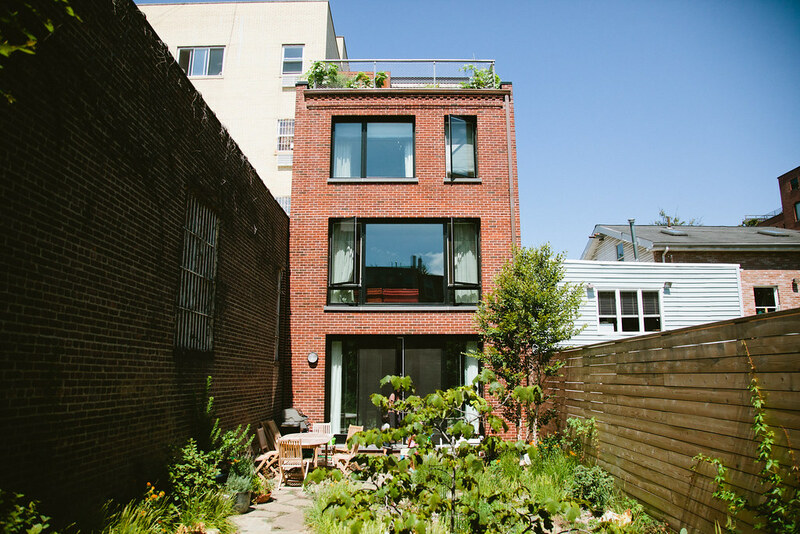 They hired the Brooklyn architecture firm CWB to demolish and replace it, and the new three-story townhouse was completed in 2014. With the new home built, the couple was able to start from scratch designing the outdoor spaces. The nearly flat roof was suitable for a terrace and plantings, and the home’s generous windows and oversized sliding glass doors looked out onto an unfinished 1,000-square-foot backyard. The homeowners wanted to convert the plot into a sustainable garden where they could dine al fresco and entertain. They also wanted a creative, child-friendly space where their young daughter and the family’s bulldog could play outside. They hired landscape designer Marni Majorelle, whose Brooklyn firm, Alive Structures, is known for creating sustainable gardens using native plants as well as green roofs and walls. 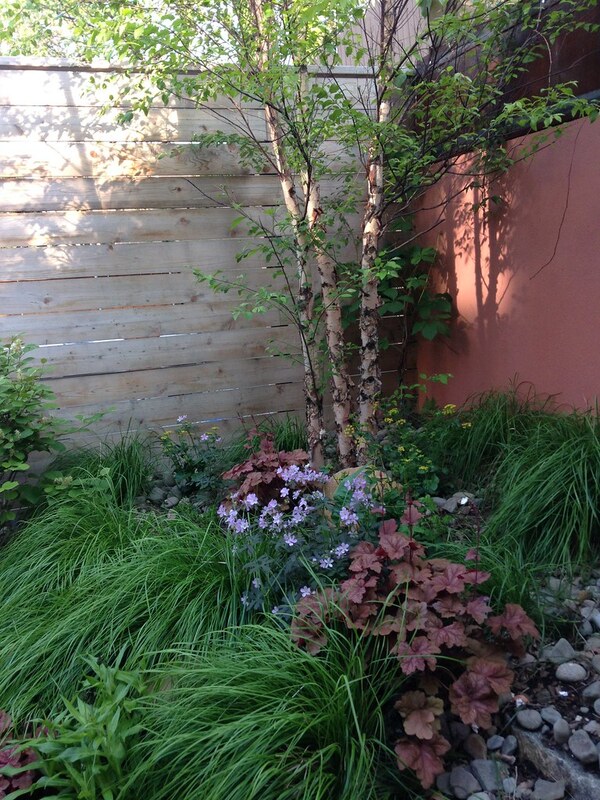 Majorelle, inspired by her own childhood memories of playing beside the meandering stream at Brooklyn Botanic Garden, designed for the owners a meadow-like ground-level garden with water features perfectly suited for a small, urban backyard. 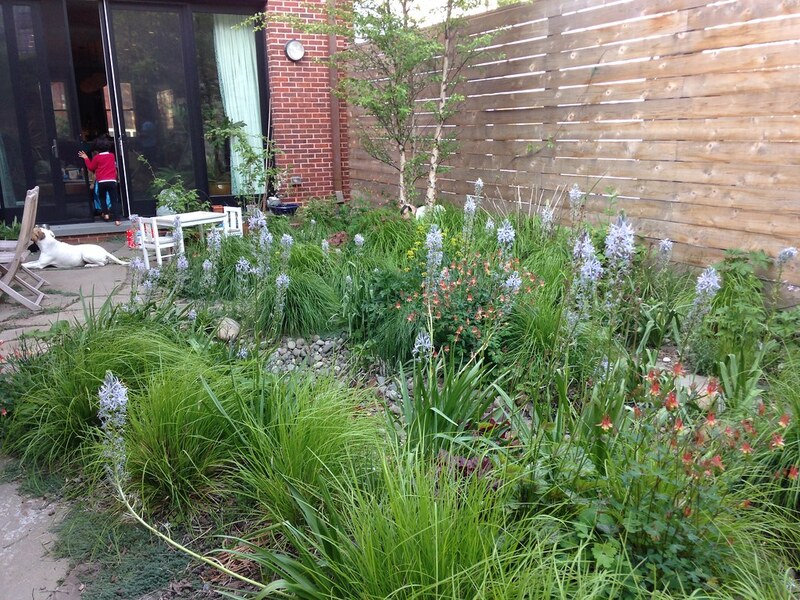 The water system is a twist on a traditional rain garden. The stream channels water to a small pond that serves as a catchment basin. Majorelle included a rooftop terrace with container plantings that also capture and channel rainwater to the stream via a downspout. During heavy rain, the system is able to hold excess water that would otherwise rush into the city’s storm drains and contribute to wastewater overflows. The family now has functional recreation space and lovely views year-round that helps alleviate a pressing urban environmental problem. The ground-level garden looks very much part of a natural landscape. Much of the space is densely planted with flowering perennials that bloom in succession. The owner calls it “a garden of surprises,” where new pops of color seem to appear almost every day. Boulders salvaged from the excavation of the property and a tiny wooden bridge provide structures for imaginative playtime. Clumps of autumn moor grass are the dominant planting throughout the garden. Although she usually prefers to use native plants, Majorelle says that she decided to go with this European species here because it establishes quickly and has an attractive low, bushy habit. Majorelle also included a mix of native flowering plants that bloom at different times throughout the year, with an emphasis on the spring display. In addition to a variety of bulbs, there are native shrubs and small trees such as wispy fothergilla and bright pink redbud, whose early blooms are followed by drifts of delicate columbine. Later, wild-flowers like milkweed and blue-eyed grass take over. River birch trees add structure year-round. The 25-foot-long meandering stream is essentially an elaborate French drain, Majorelle says. To build it, her crew dug a trench that gradually deepens from one foot to about three feet deep at the pond. It's lined with plastic pond liners and layered with stones. 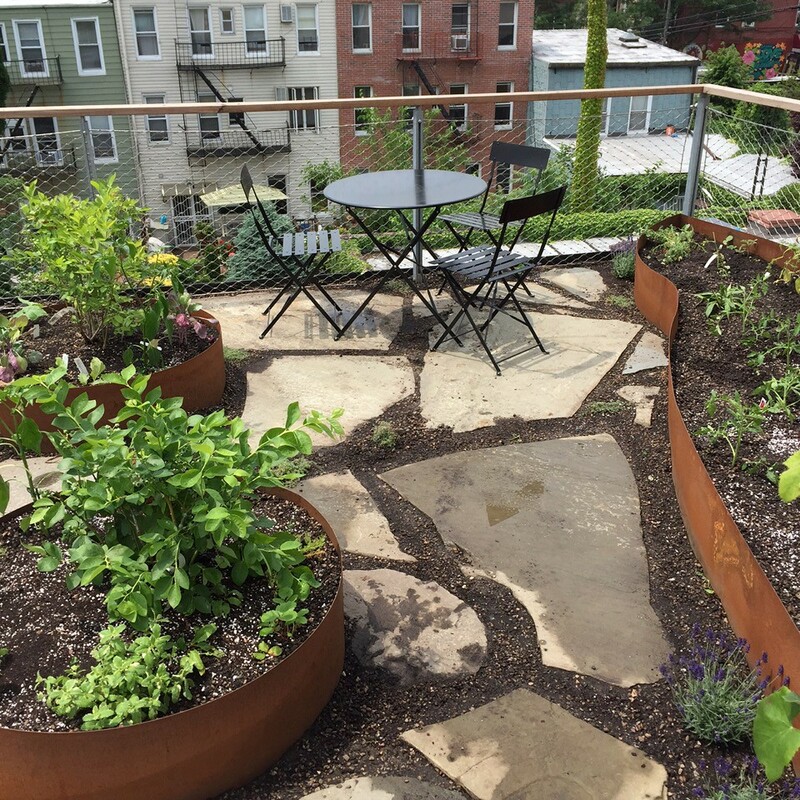 More: Learn about rain gardens, green roofs, bioswales, and rain barrels in Brooklyn Botanic Garden's Guide to Rainwater Harvest. The pond, actually a rain-capturing swale, contains two bog buckets—containers made of thick plastic that hold water, rocks, and soil. In these, Majorelle planted marsh marigolds, carnivorous pitcher plants, and tall, bright green horsetail reed. A backup drain in the pond prevents flooding in the event water level gets too high. But this is highly unlikely, says Majorelle, since the entire yard is porous. Even the path and patio are permeable, built with bluestone pavers separated by soil instead of concrete. Three stories above, the home’s 700-square-foot roof garden catches additional rainwater and channels it to the stream below via an exterior downspout. Tomato plants, herbs, blueberry bushes, grapevines, and native wisteria grow in nine custom-built steel raised beds. Water percolates through the beds, then flows into a gutter leading to the down-spout. 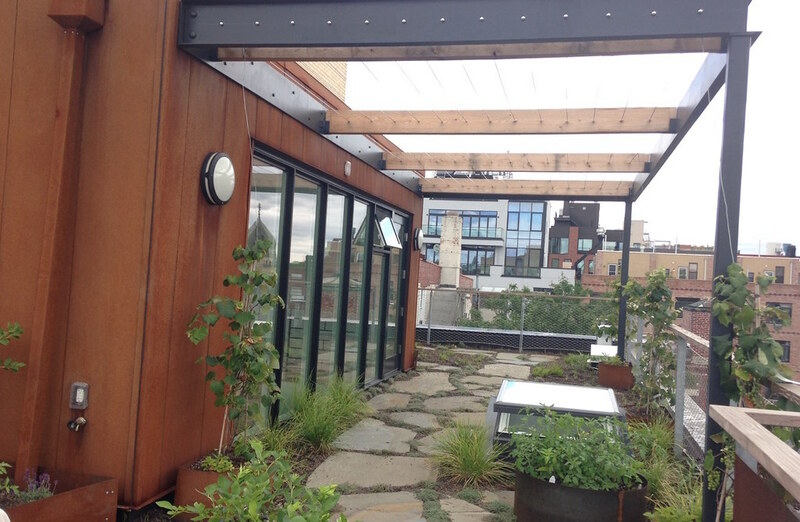 The roof is graded toward the gutter and covered with several layers of materials that protect the building while providing a nourishing environment for the plants. The soil is 5 inches deep for the rooftop meadow and walkways, 12 inches deep in raised beds. Majorelle says she was initially wary of the owners’ desire to plant fruits and vegetables on the roof, fearing that the maintenance would be overwhelming. However, the family has become dedicated to caring for their rooftop garden and take obvious joy in their involvement. The family also worked along with Majorelle and her team to plant “literally thousands” of bulbs in the backyard. In summer, the daughter, now 5, visits the roof first thing every morning to gather fruits and vegetables. The view from the roof is a panorama of crowded urban life, but to see it while standing quietly under a grapevine, beside a meadow, is to appreciate how successful this garden’s creators and caretakers have been in conjuring a hidden bower in the midst of the city. 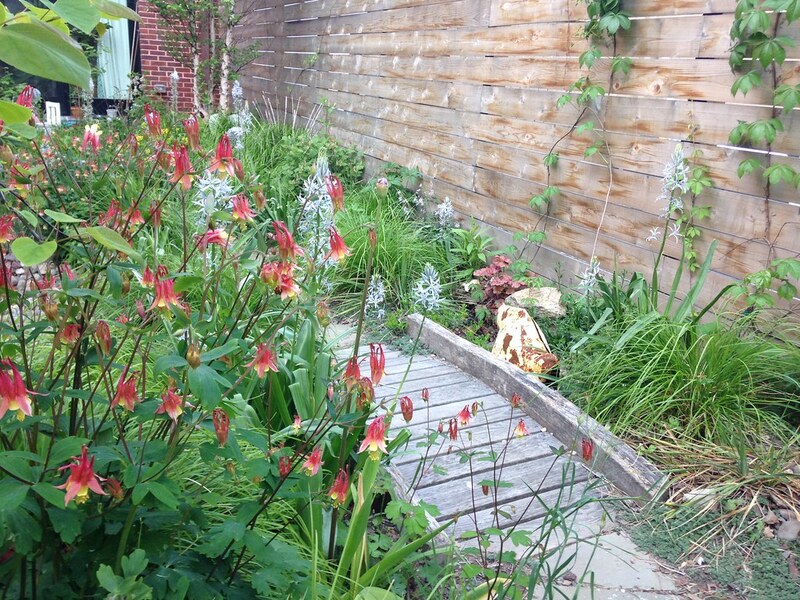 Together with the garden, this lovely space is also helping keep nearby waterways clean and safe. Jeanne Rostaing contributed to BBG's Japanese-Style Gardens handbook and writes frequently for Gardenista. The meadow-like garden is both functional and inviting. Photo by Marni Majorelle. Native columbine (Aquilegia canadensis) and camass (Camassia quamash) bloom along the bridge in late spring. Photo by Marni Majorelle. A river birch (Betula nigra) serves as a backdrop to blue-eyed grass (Sisyrinchium angustifolium), golden Alexanders (Zizia aurea), and autumn moor grass (Sesleria autumnalis). Photo by Marni Majorelle. The green roof serves as a terrace, easily accessible to the living space. Photo by Marni Majorelle. The steel-sided free-form raised beds were designed by Majorelle. Photo by Marni Majorelle. 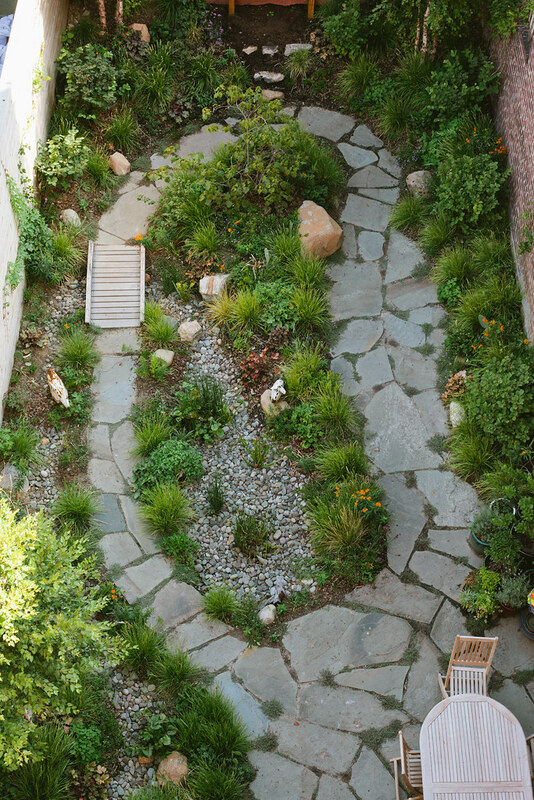 An overhead view of the ground-level garden. Photo by Joanne H. Kim. A downspout from the green roof carries water from the gutter to the garden's stream. Photo by Joanne H. Kim. 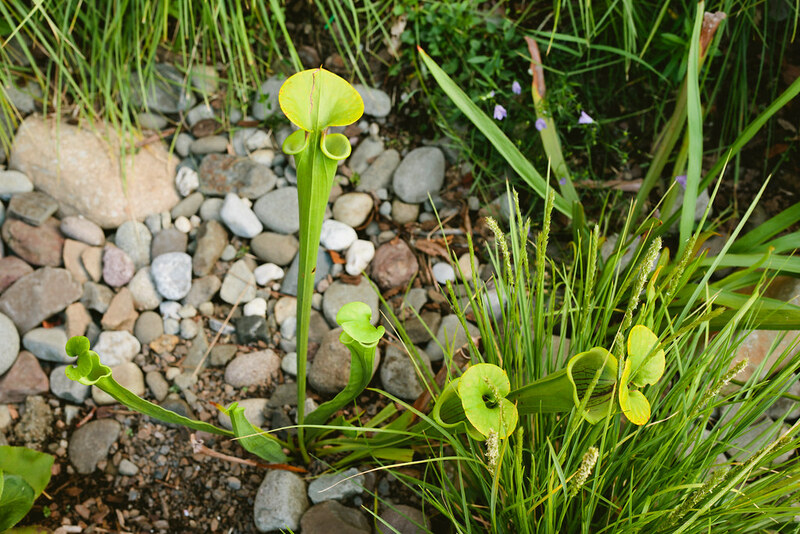 Carnivorous pitcher plants (Sarracenia species) thrive in the variable moisture levels that occur in the garden's swale. Photo by Joanne H. Kim.